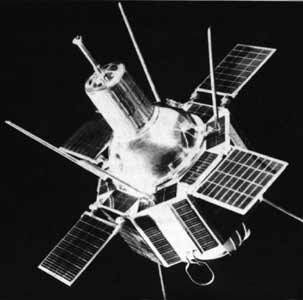 The DS-U2-M satellites were Soviet technological demonstrations satellites launched as part of the Dnepropetrovsk Sputnik program. They tested atomic clocks in space. These satellites experimentally confirmed that quantum frequency standards (atomic clocks) can work in vacuum, zero gravity, and other space flight environments. The data allowed continuing engineering development of onboard molecular oscillators in order to produce generic designs. Kosmos 97 was the first of these satellites. It was orbited by a Kosmos-2 booster from Kapustin Yar and was operated in an orbit with a perigee of 217 km, an apogee of 2020 km at an inclination of 48.4°. On 2 April 1967, it decayed from orbit and reentered the atmosphere. Kosmos 145 was the second satellite It also was orbited by a Kosmos-2 booster from Kapustin Yar and was operated in an orbit with a perigee of 213 kilometers, an apogee of 1990 km at an inclination of 48.4°. On 8 March 1968, it decayed from orbit and reentered the atmosphere.